What a rough movie to get through. After the credits rolled and the lights came up in the theater, there was not a dry eye in the house. Instead of a documentary, we have a narrative account on the real life murder of Oscar Grant, an incident that occurred on New Years Night in 2009 that sparked large protests and riots in Oakland and around the country. In his first feature film effort, director Ryan Coogler takes us through the life of Grant in the hours leading up to his untimely murder. 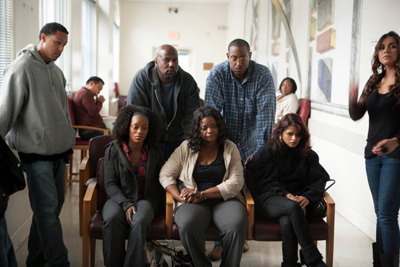 Major Hollywood figures have been involved in this case with Forest Whitaker serving as producer on the film and Octavia Spencer playing the role of Grant’s mother. This film needs to be seen by everyone and I wish I could buy everyone a ticket to see ‘Fruitvale Station’. We then rewind to the start of that day as we see Oscar Grant (Michael B. Jordan) wake up with his live-in girlfriend Sophina (Melonie Diaz) and their daughter Tatiana (Ariana Neal), getting ready for the day and their evening celebration of his mother’s birthday, Wanda (Spencer) and a New Year’s Eve party. What Coogler shows us is that Oscar is truly trying to get his life together. Over the past several years, most people might have wanted to say clear of Oscar, as he has been in prison, drug dealing, and other non-violent offenses. We see Oscar trying to get his job back at the local supermarket, when he encounters a young white female customer named Katie (Ahna O’Reilly), who is a little stand-offish at first, but quickly realizes Oscar is a charming and sweet man who is just trying to help her pick the right meal for her dinner party by phoning his grandmother to ask advice. And we have no idea that this incident will come full circle at Fuitvale. Oscar then makes a decision not to score easy money by doing a last drug deal, but throws away the drugs in an effort to clean up his life. In a flashback sequence, we see Oscar doing time in prison where his mother visits and it seems he is having a tough time with the white-supremacist gang in prison. Again this comes full circle later on as well. Planning for the New Year’s party, Oscar wants to take his family and friends to the city to watch fireworks and celebrate, to which his mother insists that they all take the train instead of drinking and driving. He agrees and the crew head out for a good time, but as a scuffle starts on the bus and is quickly ended, Oscar and his friends get off the train at Fruitvale only to meet a few cops at the scene who are looking for people who were involved in the scuffle, which turns into a horrifying and tragic event. We’ve all heard of this story before, and all too recently with the Trayvon murder case. With ‘Fruitvale Station‘, we follow Oscar, a good man who is trying to do good, have everything end for no reason whatsoever. There are social, political, and moral tones that pull at the heart-strings in this film that seem all too familiar, even a few years after this tragic event. And it still seems like nothing has changed. Coogler uses his camera as more of a fly-on-the-wall as we follow Oscar through the city in his ups and downs. Great filmmaking. Diaz and Neal turn in great performances as Diaz plays a great companion, willing to stand by her family no matter what. And of course, Spencer turns in brilliant performance as Oscar’s mother, a stern yet wonderful lady who knows right from wrong and what you need to succeed in life. Then there is Michael B. Jordan as Oscar, who deserves an Oscar for his performance. He emits a presence and shows off incredible acting chops on par with Denzel Washington. 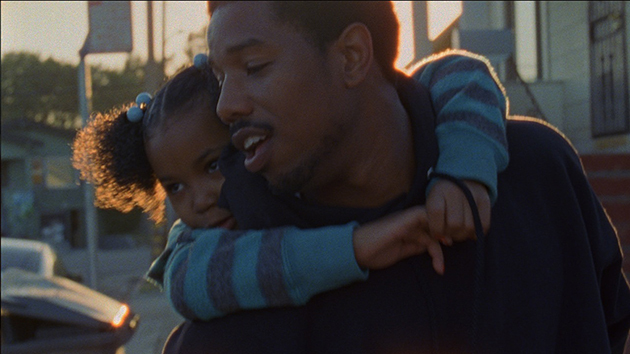 If you see one movie in the next few weeks, make it ‘Fruitvale Station’. Find Out What Kim L. Thought About ‘Fruitvale Station’!!! This entry was posted on Friday, July 19th, 2013 at 7:50 am	and is filed under Film, News. You can follow any responses to this entry through the RSS 2.0 feed. You can skip to the end and leave a response. Pinging is currently not allowed.